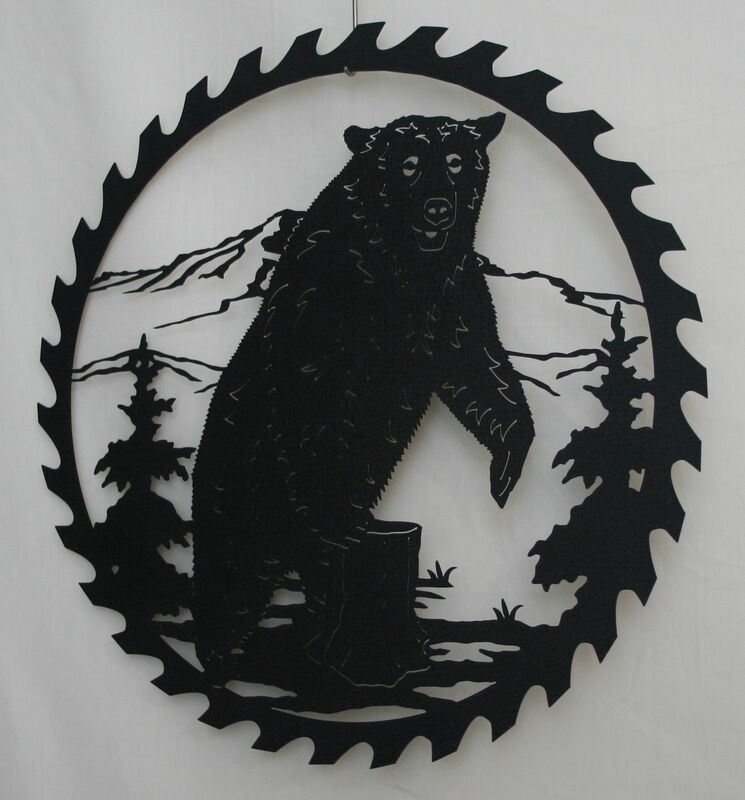 Round Saw, Bear - $42.35 (in store)A snapshot scene on this round saw blade of the bear extending to full height on his hind legs to get a better look at what's around him before he continues to meander through the pines at the base of the mountain. The powder coat finish is Black Wrinkle, an elegantly textured black with soft slate metallic shimmering undertones and matte finish. 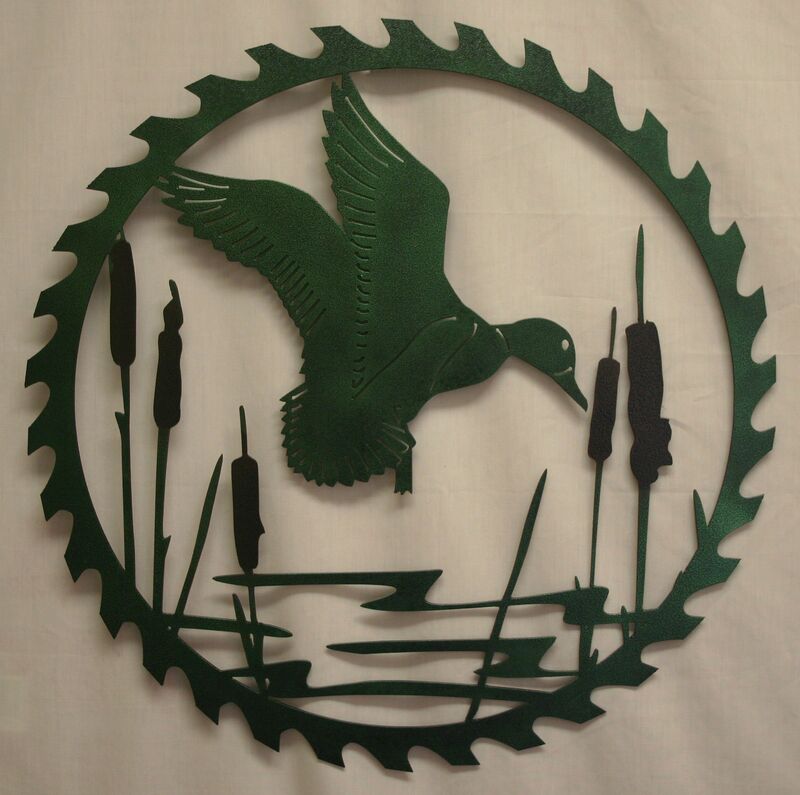 Round Saw, Duck - $42.35 (in store)You quickly catch sight of the mallard duck on this round saw blade coming in for a landing as he finds a good resting spot within the protective cover of the cattail marsh. The powder coat finish is Green Vein with the tops of cattails Copper Vein. The Green Vein is slightly textured with no undertone and a semi-gloss finish. The Copper Vein is a textured rich deep brown with slight black undertones with a semi-gloss finish. Round Saw, Pheasant - $42.35 (in store)The round saw blade reveals a striking view of this pheasant as he is flushed from its hiding spot in the brush. It looks as if he will escape even the frame of the saw blade as his head and wing extends beyond the outer edge! 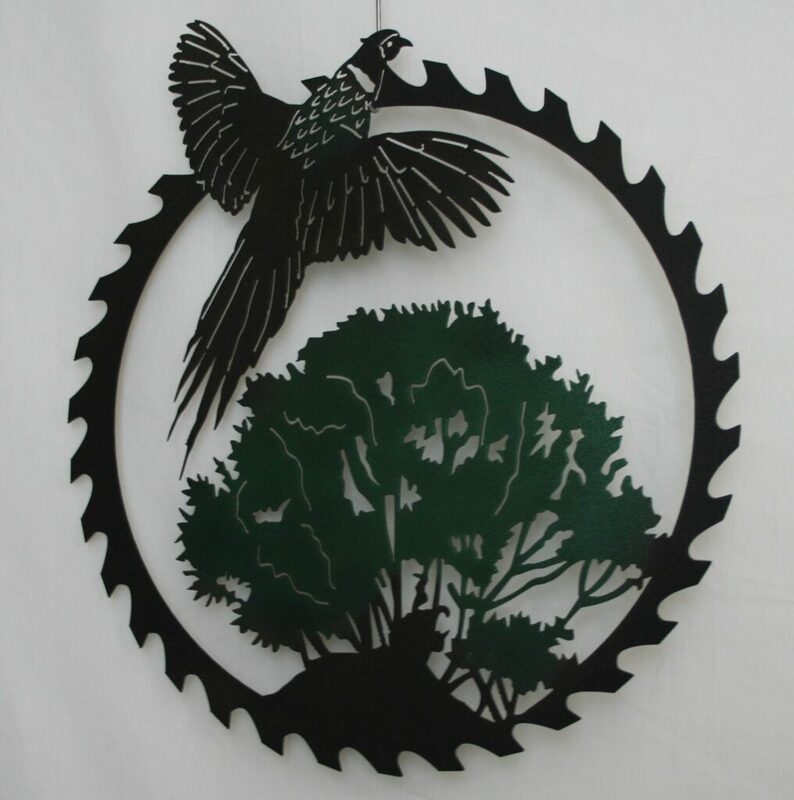 This saw blade is a two-color piece with Copper Vein for the frame and the pheasant and Green Vein for the brush. The Copper Vein is a textured rich deep brown with slight black undertones with a semi-gloss finish. 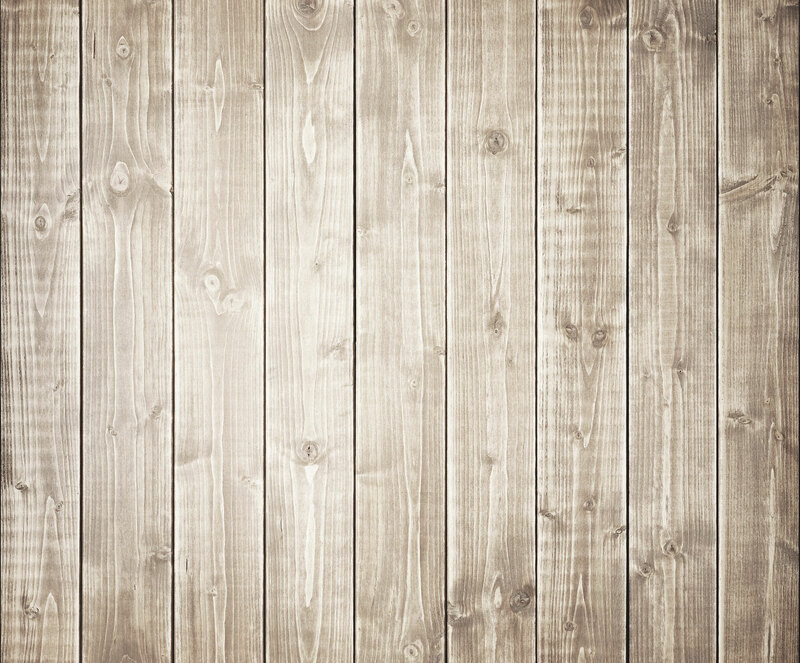 The Green Vein is a slightly textured with no undertone and a semi-gloss finish. 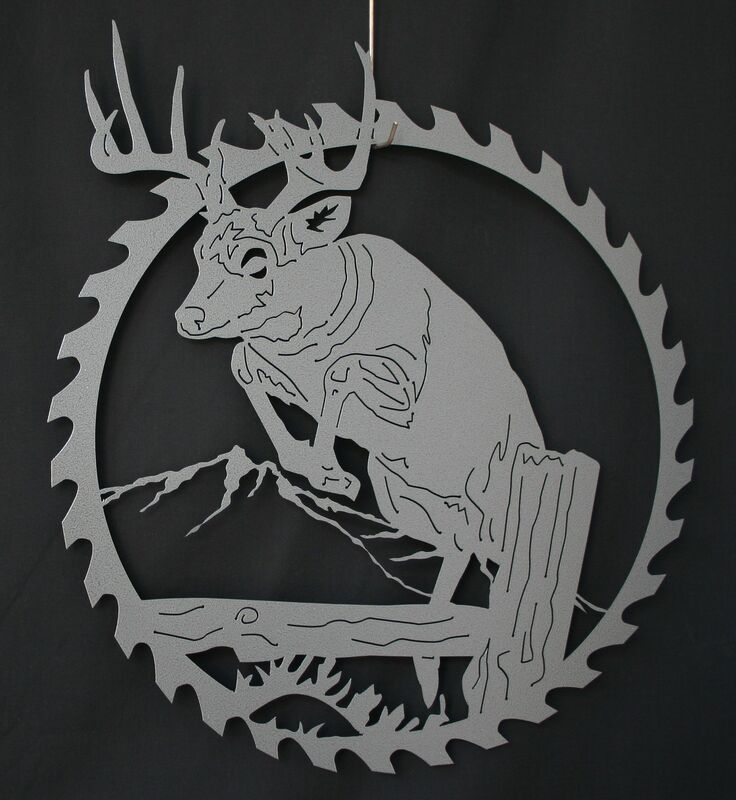 Round Saw, Buck - $42.35 (in store)With a rugged mountain as the backdrop this magnificent 10-point buck clears the split-rail fence with ease in a blink of an eye on this round saw blade. He is a massive buck as it appears he is jumping right out of the saw as his antlers extend beyond the edge of the saw. The powder coat finish is Gray Hammertone, a hammertone-textured medium gray with subtle darker grey undertones and a semi-gloss finish.